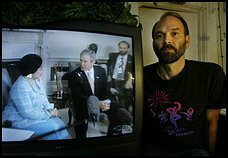 Last week I sent out an email describing both an excellent BBC documentary and my own personal experience as a presidential interpreter which reveal clear manipulations and fear-mongering by groups within the power elite in regards to the war on terror. The message is posted at this link for those who might have missed it. Here I would like to share with you more of my own experience, and the inspiring story of how this led to my becoming a celebrity for a week after recently giving testimony in the most prominent court case in Indonesia. For a brief background to the story of my week as a celebrity, Indonesia is the fourth largest nation in the world with a population of over 225 million. It is estimated that over 80% of Indonesians are Muslim, yet these warm people are known for their tolerance and respect of other religions. When I lived there for a full year with a wonderful Muslim family back in 1981, on Easter day I joined the whole family as they jumped into their car to visit and pay respects to all of their Christian friends on this most important Christian holiday. Almost all Indonesian Muslims follow this tradition, just as Christians in Indonesia pay respects to their Muslim friends on the most important Muslim Holiday Idul Fitri. And so it was that in court on January 13th, in front of hundreds in the audience and dozens of reporters, I described my experience as a US State Department interpreter at a secret meeting in the home of the Indonesian president Megawati Soekarnoputri. In this meeting, I witnessed a personal envoy of President Bush, supported by US ambassador to Indonesia Ralph Boyce and National Security Council expert Karen Brooks, put heavy pressure on Megawati to secretly capture and turn over Basyir. The reasons given were based solely on the testimony of Omar Al-Faruq, a suspected terrorist who had previously been secretly turned over to the US. President Megawati resisted the pressure, even stating, "I hope this does not lead to a severing of the good relations between our two countries." News of my testimony was broadcast on all of Indonesia's major TV stations. National newspapers (and many international papers) the next day carried articles on the American who exposed secret manipulations of his government. These articles generated even more interest in both my testimony and what caused me to be willing to testify. And so my remaining four days in Jakarta were filled with press interviews and invitations to speak at important institutions. I ended up on prime-time TV with one of the most respected news hosts in the country sharing my commitment to help all peoples work together for the good of all. Another miracle! My father was a preacher, so you might notice that some of his character rubbed off on me. I don't mean to preach to anyone, but with all the national press attention, I was thrilled to have this powerful opportunity to remind the people of an entire nation that we are all beautiful people worthy of love, honor, and respect, and that we can choose to work together for the good of all. I clearly felt the presence of the divine in providing me this miraculous opportunity to invite us all to join together in working for the greater good. I am extremely thankful to my spiritual guidance and to all of the people who helped to make my trip and testimony such a miraculous journey. I know that every one of us is incredibly blessed. I know that the more any of us open to divine guidance and to doing what's best for all, the more likely blessings and miracles will flow in our lives. I invite us all to open our hearts and work together to build a brighter future for all good people on our beautiful planet. For an update on the most incredible, inspiring work of my friend Bill Francis in helping to heal in Thailand after the tsunami, click here.